Not all prospects are prospects. Too many prospects are nothing more than suspects faking to be a prospect. Here are 5 ways to identify if who you’re talking to is a prospect worthy of your time. 1. Have they told you when they are going to make a decision? Nothing can waste more time than spending time with someone who only winds up saying they’re not going to make a decision for months. 2. Do they have a need you can help them with? If they’re not willing to share with you a need you can help them with, then stop wasting your time with them. There are far more important people you can devote time to. 3. Are you sure they’re the decision maker? Your ability to close a sale is going to go down dramatically if you’re dealing with someone who is only conveying information to the real decision maker. 4. Do they have the financial ability to buy? At one time or another, we have all taken the time of a salesperson, talking about something we want to buy but have zero ability to buy. What makes this so bad is many times the person who wants to buy but lacks the ability to buy will come across incredibly sincere. This is extremely difficult for the salesperson. 5. Has one of your competitors already clearly developed the customer’s expectations? This is the RFP or bid quote you’re asked to respond to. Very simple rule: If you didn’t help write the RFP/bid, what makes you think you have a chance? If you didn’t help write it, more than likely your competition did. 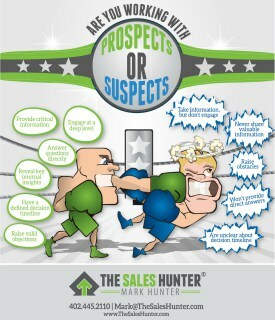 All things considered, do you know if you are working with prospects or suspects? Check out this free infographic that shows you! You can get it here. PrevPreviousAre You Asking Customers to Buy or to Invest?